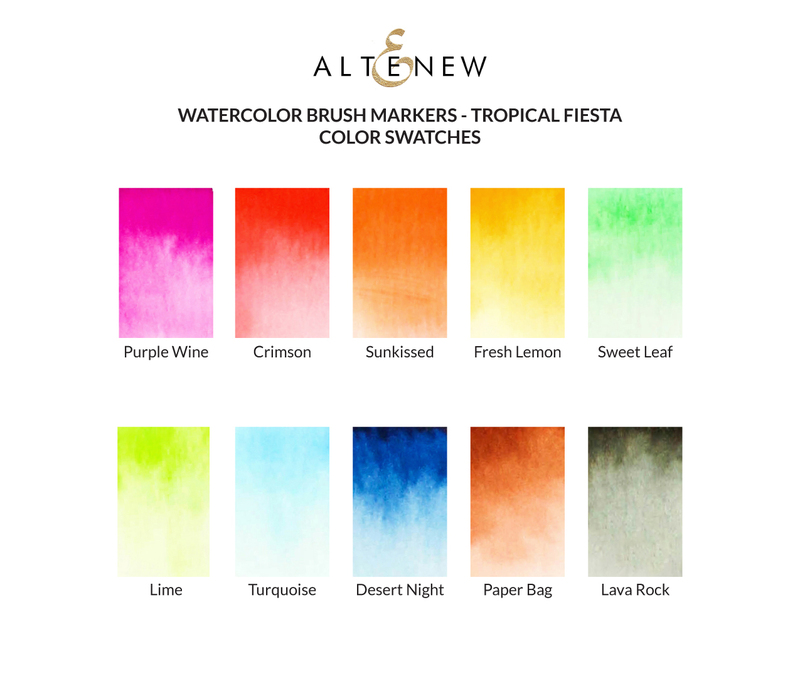 I am so thrilled to be joining the Altenew Watercolor Brush Markers Release Blog Hop today! In today’s video, I show you 5 different ways to use these amazing markers. You should have hopped over to me from Lilith Eeckels blog!!!! Let’s take a look at the video and see how I made all of the cards shown above, shall we? So many techniques using these watercolors. Which one did you like the best? I personally love the addition of the SALT! Here are a few photos of the cards made in the video! These markers are so versatile, they sky is the limit! This card was super simple, I just stamped the designs over the top in black in and matted on my favorite black velvet cardstock (click here to get 30% off) and then used the AlteNew miss you die on top. For this I did double embossing but heat embossing the trees over the top, be a little delicate with you heat gun where you already have the embossing powder but it can be done and it gives a great effect, then I stamped the hay in a subtle shade to add some interest in the bottom, the happy birthday is also on black velvet with AlteNew white embossing powder. A classic combination of black velvet matting here and then a couple of black Nuvo drops and the copper AlteNew embossing powder to add a simple sentiment. I am in love with this die, I think this is my favorite card; the sentiment is gold Altenew embossing powder. black velvet matting (of course!). Again just clean and simple, my classic back matting and then white embossing powder on the black cardstock for the thank you. Next up on the hop is Laurel Beard! As always, the supplies I used are linked below in the order as they appear on the video! I love these new pens, the colors are perfect for the start of spring! I had such fun playing around with these techniques, which was your favorite? If you have lost your way along the hop you can start back at Altenew by clicking here. There are also prizes to be won! Altenew is giving away a $40 gift certificate to six lucky winners! Please leave a comment on the Altenew Card Blog and/or Altenew Scrapbook Blog by Thursday, March 28th for a chance to win. They are also drawing a winner to receive a $20 gift certificate from the comments left on each designer’s blog on the blog hop list right at the bottom of my post. 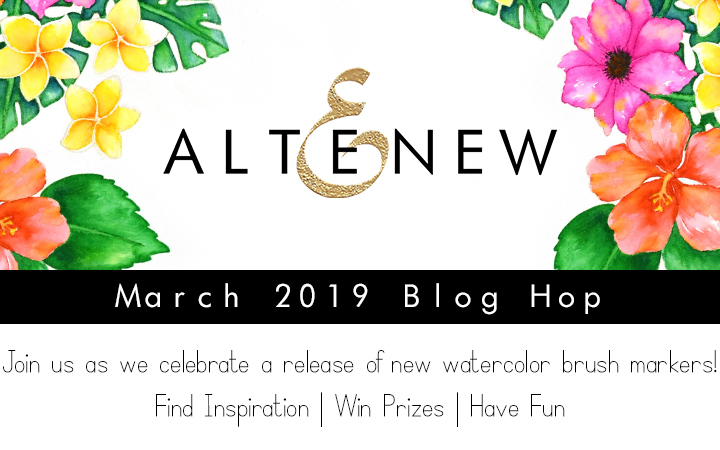 All winners will be announced on the Altenew blogs on 3/31/2019. Thanks so much for joining me today, hope you have a wonderful rest of the week! Such pretty cards! I really like the blue flower and the wet on wet technique! So pretty! very pretty cards! love the vibrant colors! You have given me a lot of ideas for Altenew products. Thank you. Always looking for a more masculine card ideas. Love the background and simple dots. I love these new tropical color pens and the colors are just right for spring too! I especially love the dark color on the flower – so intense! Can’t wait to add to my collection! Gorgeous cards. Great techniques. Thank you for sharing your talents. These new colors are beautiful! Thank you for showing so many techniques and examples using them. Absolutely gorgeous colors! Fabulous inspiration, I like all the cards, but I think today my favorite is the one with the half tone circles!Thanks for all you share! Totally rocking this new release! The cards all look great! Beautiful cards! Love the vibrancy of the watercolor markers and you have used them uniquely. Haven’t been able to watch the vid yet, but LOVE them all. My fav would have to be the one with the leaf medallion. WOW!! You totally rocked with these beautiful colors. Your cards are just gorgeous! Well I can tell you had a special kind of fun with these today ! Such great cards. My fav is the die card that you colored. These new colors are amazing. Very pretty cards! Thank you for all the inspiration! Beautiful! You do such a lovely job! Such a pretty collection of cards! Love the new colors. Thanks for sharing all the different ways to use the markers. Very pretty. Thank you for an awesome tutorial! I love the various ways you use the Altenew Watercolor Brush Markers! Gorgeous cards!! Love the salt! The pens are some of THE best colors!! Oh my! Those are amazing cards and a terrific new color set. Salt is always such fun to use! Can’t wait to try these beautiful colors of the watercolor brush markers! Enjoying the inspiration along the hop! Thanks for sharing your lovely cards! Lots of great ideas!! Beautiful. These are all so fabulous!! Love the different styles; so fun! Fabulous cards! Gorgeous new colors of Watercolor Brush Markers. Love all your wonderful techniques and great video. Alexandra, your videos are always super informative and helpful. Thank you! My favorite technique is using the salt. I also love the beautiful blends you get from wet on wet. I cannot wait to get my hands on these vibrant pens so I can try out some of these techniques. 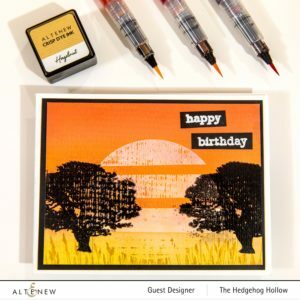 I love the set on set stripes of color with stamping on top of using it to diecut. The one that you added salt came out so cool. I want to try that too! So many new ideas. YRS Alexandria. Have a great day! I am off to watch more hop videos. TTFN. Love these new watercolor markers! Beautiful colors! And, thanks for really letting us see how they work…all your techniques demonstrated the colors perfectly! Beautiful cards! The watercolor pens are awesome! So many wonderful cards!! Beautiful watercolor brushes. Such bright and vibrant colors!! Lovely cards. I love your techniques especially the salt technique. Can’t wait to try it. Love seeing all the techniques! Great cards. Beautiful group of cards and great techniques. Thanks for sharing all of these. All of your cards are amazing! Love the colors and the video is well done and very helpful. Thanks for the inspiration! What creative ways of using these new watercolor markers. I would have to agree with you, the salt in the water was my favorite technique. So many fabulous ideas. Love them all! Thanks for sharing. I love the idea of using salt water to create effects – can’t wait to try this! Your videos are always very informative-thanks! Enjoyed your video. I’m in lover with altenews Markers the colors are wonderful. Lovely cards….and that was a great and informative video. Thank you very much for that. This blog hop has been so much fun….so much talent. Off to finish the hop! I like the one with the double embossing that looks like an African plain. Thanks for all the tips in the video! Such a nice assortment of cards. I love your colors and the video. That was a long video, but it sure was helpful. I’m new to watercolor markers. I do own some Arteza, but I have yet to get up the nerve to try them. I left a comment on your Youtube channel along with a thumbs up. I was surprised to hear that you are from Ohio. Your cards look great. I like the medallion one and the sunset one the best. They are all great though. Whoa Alexandra! Five different ways of using the watercolour brushes. Good on ya girl! I really like the vibrancy & depth of colours you can achieve with these brushes. I particularly liked the heat embossed flower with the shades of blue. & the sunset look with the two trees. Thanks for taking the time to make the video too! Great techniques. I am new to watercoloring. Love the sunset and the leaf medallion . So many great techniques to try with the new watercolor pens. You’ve given us some great ideas by sharing your lovely cards. Wow! I just love these colors! Very nice cards. Always have enjoy your videos. 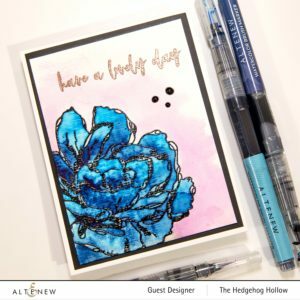 Great to see The Hedgehog Hollow as guest designer for Altenew. Beautiful Cards! I think the “thank you” card might be my favorite, but I really like all of them. Thank you so much for doing the video! I’ve been trying to get the hang of watercoloring and I need all the help I can get! I love the new colors! Gorgeous cards. I really enjoyed watching you demonstrate five different ways to using the new Altenew watercolor brushes. The salt technique intrigued me. Thanks for sharing your time and talent with us. Gorgeous cards! Love the new colours in this watercolour set. Thanks for your video and all the techniques you demonstrated. Lovely cards – really like the salt technique! Beautiful colors in this new set from Altenew. Beautiful cards and great video. Love all the different techniques and ideas. Always learn something new. Thanks so much for sharing your art. Lots of great ideas for using these markers. Your cards are stunning! I intended to just watch a portion of your video and come back later, but I was memorized by your techniques and watched the whole video in one sitting! All of your cards are beautiful but my favorite is the blue flower it’s just gorgeous! I love all your ideas keep them coming! Beautiful cards! I love all the great designs! Awesome cards, Alexandra! Love the different looks! My fave is the last card with the white embossing. Gorgeous! What a great variety of using these markers! Thank you for the inspiration! Thank you for showing us simple ways to make such beautiful cards! These Altenew watercolor markers are so versatile! That Rinse Well product is really cool! Thanks for the great tips on using these watercolor markers. This new set is fabulous — I love the vivid colors. Your cards are gorgeous. Beautiful set of cards. Love how you used these brushes to make those lovely sunset/sunrise backdrops. Love how you made that one card with the uncoloured flowers and that rich coloured backdrop – what a great idea! Love that mandala, and the wet on wet technique. Your double embossing technique on the tree card is also very creative. These new watercolors are beautiful. Thanks for all the amazing ideas! I really loved the big blue flower card and the mandala looks great too. 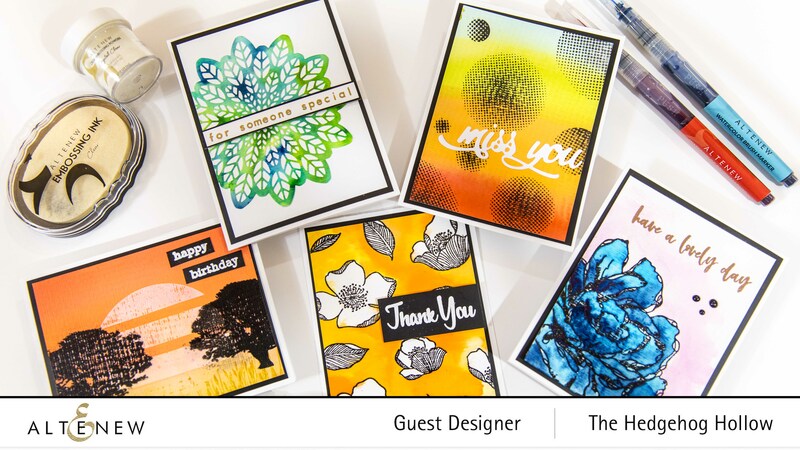 Such fabulous card designs! I love all the colour combinations you used! Such beautiful cards! Thanks for taking the time to demo so many ways that we can use these markers- I find that to be very helpful. The colors are just….yummy! 🙂 Thanks for participating in the blog hop today – Altenew, Can’t wait to add these to my crafty stash! Wonderfully bright, happy cards, Alexandra! Love these bright new colours! So vibrant and add so much to your clever designs! Thanks so much for sharing and the great inspiration! Great cards and an amazing line-up of techniques. Thanks for the informative video. It is very helpful. My favourite is the last card. I just love the vibrant background. Looks absolutely gorgeous! I’m happy to see you on an Altenew bloghop! Thanks for sharing several ways to use these markers. I think my favorite is the leaf burst die cut. How can I resist some of my favorite colors paired with one of my favorite dies? Wow, gorgeous collection of cards! Fantastic designs and inspiration. These cards are so striking! I love the gorgeous washes in those first two cards!